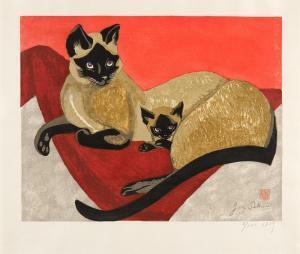 Find artworks, auction results, sale prices and pictures of Jun Ichiro Sekino at auctions worldwide. 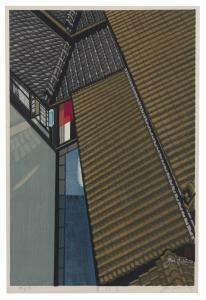 Jun\’ichiro Sekino Untitled (Rooftops) 1969 Color woodblock print on paper #56 of 98 Signed in white ink and stamped with artist's red seal lower right in image; signed and dated in graphite lower right margin beneath image; edition lower left; inscribed in Japanese lower center edge of sheet Image: 32.125" x 21.75"; Sheet (vis. ): 33.75" x 22.75"; Frame: 39.625" x 28.75"
Lot# 2029 Junichiro Sekino (1914 - 1985 Japanese) "Chiryu", from "Fifty-three New Stations of the Tokaido" Woodblock on handmade paper under glass Signed in graphite lower right: Jun Sekino and with the artist's chop mark, with the artist's watermark lower center Image size: 12.75" H x 18" W Provenance: Estate, Los Angeles, CA. Notes: Paper size: 16.5" H x 21.5" W; framed size: 22" H x 27" W x 1" D. Condition: Generally good condition. Minor toning to the paper. The paper with deckled edges. Framed floating and mounted to the back mat. 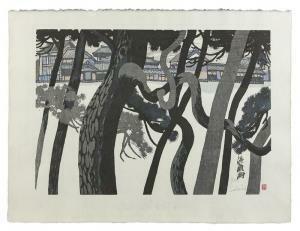 Description: WOODBLOCK PRINT: ROCK GARDEN WITH LANTERN. Japan. Shôwa period. 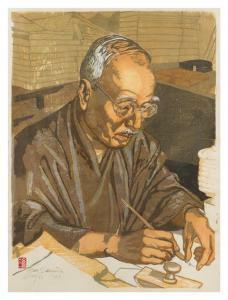 Sekino Jun'ichirô (1914-1988). Nishiki-e, Mokumezuri. 63.1 x 22.8cm. Sign. : Jun. Sekino & Seal: Sekino. Condition A/B. Few slight creases. 1914 - 1988 Holzschnitt: Steingarten mit Laterne Japan. Shôwa-Zeit. Nishiki-e, Mokumezuri. 63,1 x 22,8cm. Jun. Sekino. Sekino. Zustand A/B. Wenige leichte Knicke.